Hanoi (VNS/VNA) - Two years ago, Vietnamese gymnasts brought home nine gold medals from the Singapore Southeast Asian Games. At the ongoing Games in Malaysia, Vietnam is competing in all disciplines, but the target is only one third of that. The first reason is that organisers of the SEA Games have reduced the number of events from 14 to 12. The two events that are not held are the men’s and women’s individual all-round categories, which were dominated by Vietnamese athletes at the previous Games. The second reason is the absence of "gymnastic queen" Phan Thi Ha Thanh, who retired last year. In Singapore, Thanh won three titles in the women’s individual all-round, vault and balance beam categories. Following Thanh’s retirement, Vietnam’s women team have not found a strong athlete who can carry forward her task. There are five female athletes competing at the SEA Games, but their chances of winning are uncertain. “Following Thanh’s departure, only Truong Khanh Van, who is participating in the balance beam and floor, and Nguyen Thi Huynh Nhu, a competitor in the vault, can be considered medal favourites. The others are still young and lack international experience, although in terms of technique they can beat the top three,” coach Nguyen Thi Thanh Thuy said. “The women’s squad just participated in two local tournaments and I saw their progress, especially in terms of their mentality. Hopefully they can bring that into play in Malaysia. In my opinion, a berth in the top three is a success for us,” she added. The gold medal target has been given to the men’s team. “Compared with other teams in the region, Vietnam are the strongest. However, this year, countries have strongly supported their athletes, therefore, we will face challenges,” head coach Truong Tuan Hien said. “The men’s crew just set a target of three goals; it will be a heavy-duty tournament for them. They have worked hard. It is difficult to say prior to the events, but I believe they know how to overcome challenges to complete their task,” Hien said. “We have powerful athletes such as Dinh Phuong Thanh, Bui Dang Nam, Pham Phuoc Hung and Le Thanh Tung. They can all take top positions,” he said. In preparation for the Kuala Lumpur Games, the athletes enjoyed a three-week training course in Wuhan, China, in July. “The course helped players improve their technique. Now they are excited and ready for the Games,” coach Truong Minh Sang said. Hanoian Dinh Phuong Thanh is the golden hope of the team. He was the first Vietnamese to win the SEA Games all-round title, apart from winning in the parallel, horizontal bars and team events. Although the all-round category is not taking place this year, Thanh still has other targets. “I am confident about the parallel and horizontal bars. At present, my performance on the pommel horse is also okay. I hope I can succeed in all three categories,” Thanh, who won a bronze medal in the parallel event at the Asian championship in May, said. The other hope is Le Thanh Tung, who has made remarkable progress in his career at international competitions. The SEA Games defending champion grabbed a gold medal in vault at the Qatar World Cup in March and then went on to triumph at the Asian championship two months later in Thailand. “Tung was born in 1995. 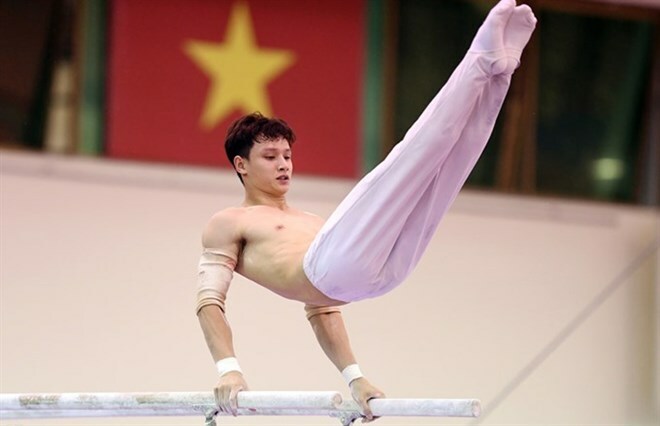 He is one of the young and talented gymnasts of Vietnam. His success in Thailand was great and it would be strong push not only for him, but also for Vietnam’s gymnastics at international tournaments, including the SEA Games,” coach Sang said. Gymnast Dang Nam is competing in the rings event. He overcame teammate Pham Phuoc Hung and Weena Chokpaoumpai of Thailand to win two years ago in Singapore. Nam, who also won at the Myanmar Games in 2013, is hoping to complete a hat-trick of gold at his third consecutive SEA Games next week. Hung, who is the most experienced member of the team, will participate in five out of six individual events in Malaysia. The two-time Olympian thinks this could be his last time at the SEA Games. “I will try my best to get a high score, which would not only help me pocket my own medal, but also contribute to the team event,” Hung said during his last days of training in Hanoi. Hung, who has won six SEA Games gold medals in his 20 years of competing, expects to top the podium at least once this August. At the last Games, he participated in five events and bagged one gold, two silver and two bronze medals. Thanh, Tung, Nam and Hung are also set to help their team win the event title.